Spring into this new season! Spring into the new season with potted vignettes that exclaim “out with winter” and “in with buds and blooms.” Here is a container combination — with pastel-petaled tulips, sunny daffodils, bright green foliage and sweet strawberries — that capture spring in all its glory. Celebration of spring. Welcome the season with a sunny arrangement of mixed bulbs of various heights and delicate pansies tucked to fill in around the base. 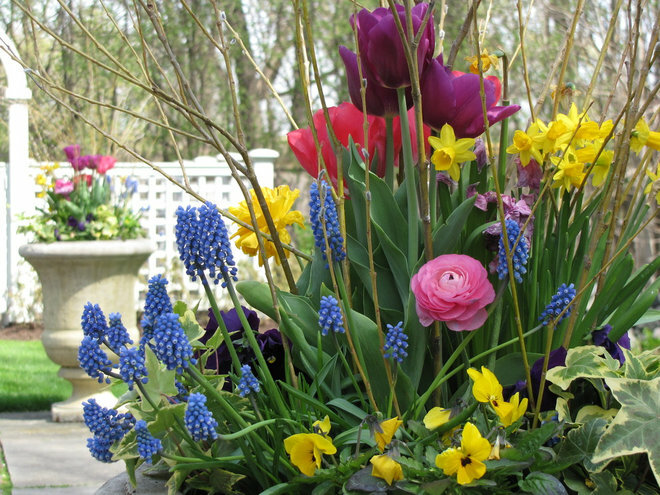 Here, a pair of deep urns planted with medium-purple tulips, yellow daffodils, pink ranunculuses, grape hyacinths (Muscari sp. ), pansies and variegated English ivy makes a glorious entry arrangement. Holiday Gift Giving made with love! Previous post: Set your clocks forward 1 hour on Sunday, March 12!